On March 25, 2019 at 3:05 p.m. Officer Shore was on patrol on Washington Street near Eaton Court when he observed a Honda sedan and conducted a random query of the vehicle’s registration. The query showed that there was an active default warrant issued by the Stoughton District Court for the owner. Officer Shore stopped the vehicle and spoke with the operator and owner. He was taken into custody, transported to the station, booked in the usual manner, afforded all rights and released on bail. On March 30, 2019 at 11:34 p.m. Officer Griffin was on patrol on Washington Street at State Street when he observed a vehicle turning from State Street onto Washington Street. As the traffic light turned from yellow to red the SUV sped up and its tires screeched as the vehicle was turning. Officer Griffin stopped the vehicle and spoke with the operator. His eyes were bloodshot, his speech was slurred, he was moving in a sluggish manner and the officer detected an odor of an alcoholic beverage emoting from the vehicle. Officer Griffin asked the driver if he would be willing to take some reasonable tests of balance and coordination to determine if he was able to safely operate a motor vehicle. He was unable to successfully complete these tests. He was taken into custody, transported to the station, booked in the usual manner, afforded all rights and later released on personal recognizance. On March 3:15 a.m. Officer Gerard spoke with a taxi driver who requested assistance with a male fare that had fallen asleep in the taxi and he was unable to wake the male party up. Officer Gerard attempted to wake the male passenger and was unable to do so. The Cataldo paramedics were contacted and were also unable to wake him. He was transported to the hospital for medical treatment. Another resident of the male party’s household paid the cab fare. On March 18, 2019 at 2:00 a.m. Officer Knapp was conducting traffic enforcement on Worcester Street when he conducted a random query of a Nissan sedan’s registration. The query showed that there was an active warrant for motor vehicle related charges for the owner of the vehicle. Officer Knapp stopped the vehicle and spoke with the operator and owner. She was taken into custody, transported to the station, booked in the usual manner, afforded all rights and later released on personal recognizance. On March 24, 2019 at 9:55 p.m. Officer Dixon was assisting another officer on a traffic stop on Worcester Street near Washington Street when he observed a motor vehicle approaching their location at a high rate of speed. When the vehicle got closer to the marked police vehicle with its emergency lights on it swerved abruptly to the left to avoid striking the cruiser. Officer Dixon stopped the vehicle and spoke with the operator, and requested her license and registration. Officer Dixon explained that he stopped her because she failed to move over for stopped emergency vehicles and she indicated she didn’t move over because there were no traffic cones indicating that she needed to move over. Officer Dixon explained to her that it is the law that vehicles must move over when they approach an emergency vehicle on the side of the road for safety reasons. A query of her information showed that she had an active warrant issued by the state of Rhode Island for embezzlement and fraud. Additionally, her registration was revoked in January of 2018 for lack of insurance. She was taken into custody, transported to the station, booked in the usual manner, afforded all rights and held without bail. On March 19, 2019 at 12:33 p.m. Officer Cunningham met with a resident who wished to surrender two firearms that were no longer wanted. Officer Cunningham took custody of the firearms, marked them for destruction and properly secured them until they can be destroyed. On March 19, 2019 1:35 p.m. Officer Cunningham spoke to a female reporting party who stated her bank notified her that an unknown female party with an accent contacted the bank twice claiming to be her and attempted to gain access to her accounts. The individual was denied access on both occasions. Officer Cunningham is investigating. On March 23, 2019 at 10:21 a.m. Officer DiCenso spoke with a female party who stated she received several pieces of mail from a financial institution regarding overdraft protection on an account. The reporting party indicated she does not do business with this particular financial institution and contacted them. They advised her to contact her local police department and that a member of their fraud department would be in contact with her. The reporting party has not suffered any financial loss at this time and was advised to monitor her credit. There are no suspects. On March 24, 2019 at 11:34 a.m. 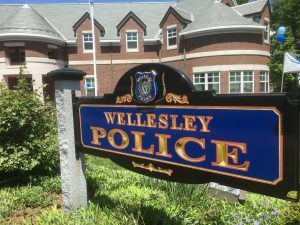 Officer J. Popovski spoke with a male and female reporting party who stated while they were away they learned that their son’s Trek bike was seen at the Wellesley High School. Upon returning home they located the bike locked to a bike rack with a lock that did not belong to them. The serial number matched the paperwork they showed Officer J. Popovski from when they purchased the bike and there was a label on the bike with their son’s name on it. The lock was removed and the bicycle was returned to the proper owner. There are no suspects at this time.